Philip Seymour Hoffman’s political documentary: The Party’s Over. 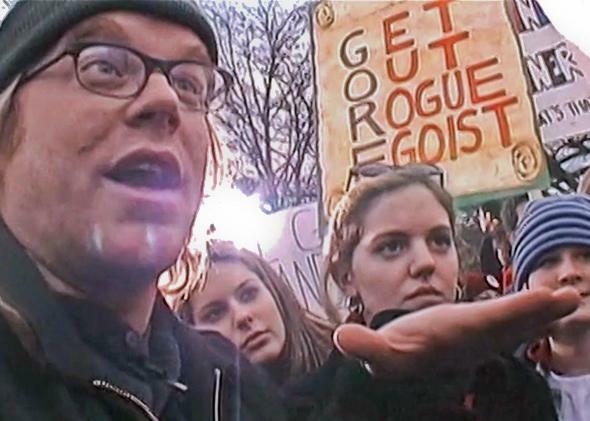 That time Philip Seymour Hoffman made a political documentary. The 2000 election as hosted by Philip Seymour Hoffman. Philip Seymour Hoffman slumps in his chair, dressed for a sick day—baggy clothes, knit cap. He lolls his eyes at a TV set that’s playing a series of depressing videos from the 2000 presidential campaign. George Bush yammers his talking points. Al Gore rises like Aphrodite, shirtless, out of a tossing sea. This is the first real scene of The Party’s Over, also known as Last Party 2000, maybe more easily explained as Hoffman’s sole political documentary. For a few weeks that year, a 34-year old Hoffman teamed up with filmmakers Donovan Leitch and Rebecca Chaiklin and acted as a layman guide to America’s last pre–war-on-terror election. The result was a curio that hasn’t been discussed much by Hoffman’s countless admirers and eulogists. He was probably the best actor of his generation, and there’s no acting in this movie. The Party’s Over was one of the only sequels Hoffman ever made. Eight years earlier, Leitch had produced a similarly experimental documentary, The Last Party, in which a manic Robert Downey Jr. sort of reported on the 1992 election. I say “sort of” because the most memorable parts of the movie are not his interviews (he asks Bill Clinton if “anybody under 30” will speak at the convention) but the many scenes in which Downey unleashes his inner “goat boy” and jumps around on all fours. Much closer. Hoffman tended to sound wise, sad, and searching in the many interviews he gave about his acting. If he’d researched a role, he could explain the character’s motivations and biases with the skill of an authorized biographer. But as a political correspondent he was earnest and occasionally overwhelmed. The film lets us see Hoffman struggling to escape the cesspool. “I’m nervous,” he says before a hastily-scheduled interview with Jesse Jackson. “I’m forgetting all my questions.” Hoffman eventually just lets Jackson roll, nudging him along to see how much contempt he has for the Republican rebranding effort that defined the 2000 convention in Philadelphia. The actor takes the same approach with everyone who comes on camera. They know more than him, fine—he’s not going to nail them, but he’s going to see how well they’ve thought through their dogmas. The more they had, whatever those dogmas were, the more engaged he got. After a night in a debate spin room, Hoffman wipes his brow with frustration at what John Kerry, Karl Rove, and the rest of the hacks have been telling him. Cut to an interview with Noam Chomsky about how meaningless the exercise had been. He also happened to cover the most depressing election in a baby boomer’s lifetime. Filming was supposed to wrap on Election Day. The election didn’t end right then. The filmmakers hurried to Florida to cover the recount, and when he found time, Hoffman returned to Washington to gawk at the protests outside the Supreme Court. The cameras capture a series of protesters debasing themselves in the interest of making sure their candidate won. Hoffman tries to argue with a Republican who wants to stop the count before every county can be recanvassed with the same standards. The image freezes. “He’d just realized that the whole act of voting and making your voice heard got hijacked by high-powered attorneys,” says Leitch. The Party’s Over ends with a shrug. Bush is inaugurated. Hoffman walks across a crowded New York street. He doesn’t have anything to say.